A while ago I received two official samples from Benromach. One is the new 10 year old edition and the second one is the 1976 Vintage edition. The package did go with a nice letter from the managing director (Michael Urquhart) explaining the meaning of this combination in a single phrase “A Fingerprint to connect the old with the new”. The samples are from the same distillery, but different eras and by different owners (Present owner Gordon & Macphail, since 1993). Let start with the new edition of the Benromach 10. It is a combination of 80% Bourbon Barrel and 20% Sherry casks before the spirits are combined for a final year in Oloroso casks. Bottled at 43%. A nice amber colour is the result (no colouring added). Very aromatic nose with an instant hint of smoke. Quite a bit of oak combined with a sweet fruitiness. Honeyed apple (stewed apple comes in mind with cinnamon and vanilla sugar), peach and raisins combined with a dark tone of spice, perhaps some other wood spices in the background. All combined with a chocolate and smoky topping. Surprisingly complex. Quite some power, despite the ABV of 43%, initially the smoke comes first and plays with the sweet influence of sherried notes (a bit vinegar, raisins, honey, peach, apple) also a bit oaky. Again there is also an influence of cinnamon (ginger or even some pepper also present). Very waxy also, very coating and extremely pleasant. Surprisingly loooooong… a tad bitterness at the end, but mouth coating and –watering greatness….very warming sherry notes, combined with a vanilla freshness from the bourbon casks and again that fruit stewed in sugar and honey to give it a complex and very enjoyable finish. Very pleasant surprise, it is a joy to enjoy this whisky, which never feel his age (much older), nor has the feel it could use more ABV. And now the most stunning part, it only sets you back a 35-40 euro! How’s that! You certainly should try this! Benromach keep up the good work! Also thank you Jan Beek for the help for receiving these samples, looking forward to taste the 1976! 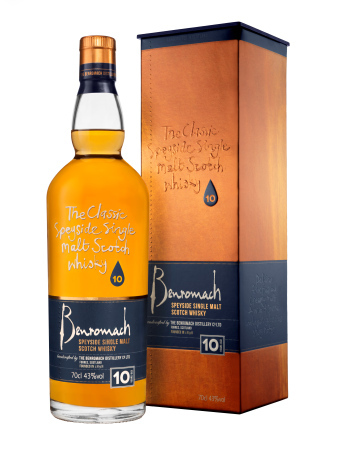 This entry was posted in Benromach, Speyside notes and tagged 10 year old review, 10 year old tasting note, Benromach, Benromach 10 year old 2014 edition, Benromach 10 year old review, Benromach 10 year old tasting note, Benromach review, Benromach Tasting note, Excellent whisky, Gordon&Macphail, Scotland, Speyside, whisky, whisky review, whisky tasting note. Bookmark the permalink.